Let Your Light Shine! Seeking submissions which demonstrate how you increase the visibility of school nurses! This page honors Lillian Wald, pioneer nurse and social reformer. Lillian refused to be minimized. She fought tirelessly to shine a light on health and social justice. LYLS Column (Let Your Light Shine) is a place for you to shine your light. What good things are you doing to promote student health and school nursing? How did you become more visible to your community? Did you develop a health office web page? Present to your PTA/PTO, School Board, or colleagues? Highlight school nursing statistics to your school board? Meet your state legislator? Publish an article? Host a nursing student? Win a grant? Conduct a health fair? Be interviewed for an article? Bring a dental clinic to your school? The possibilities are endless. This is your time to shine! We can all learn from each other. Your submission may spark an idea in another school nurse, so let’s hear from you! Congratulations to Nancy Antonini, BSN, RN, PEL-CSN who has been selected as the 2018 National Association of School Nurses Outstanding Special Needs School Nurse! Nancy is the Certified School Nurse Consultant for the Lincoln-Way Area Special Education District in Frankfort, IL. She is passionate about her work in developing safe transferring/toileting protocols for special needs students. She has helped with the collecting and uploading data for the NASN Step Up & Be Counted Project. Nancy was presented the award at the June 2018 National Association of School Nurses annual meeting in Baltimore! Congratulations to Cathy Yonkaitis, DNP, RN, PEL-CSN, NCSN as the 2018 National Association of School Nurses Outstanding School Nurse Educator! Cathy leads a national model program for school nurse content, leadership and professionalism. With Erin Maughan, PhD, MS, RN, APHN-BC, NASN Director of Research, she has created a national program for the translation of evidence based practice in school nursing. Cathy was presented the award at the June 2018 National Association of School Nurses annual meeting in Baltimore! NASN President Nina Fekaris has just announced that Eileen Moss, IASN member, has been chosen to receive one of the 3 NASN Endowment Education Scholarships. Congratulations to Eileen who is a DNP student at UIC. A HUGE shout out to School Nurse Kathy Knawa who was just one of the featured speakers on a TV commercial for Cook County Public Health “Health Spots”. Wow! A major network morning show! Kudos to Kathy! Congratulations to Dr. Angela Lepkowski and Dr Viginia Reising both Illinois Certified School Nurses. They earned their Doctor of Nursing Practice degree May 10th. On Tuesday, Dec. 12, Downers Grove North (DGN) High School nurses Mary Beth Tamm, certified school RN, and Maggie Hansen-Hyman, RN, were honored with a Lifesaving Award from the Downers Grove Police Department. The awards were presented by Lieutenant Robert McMahon in front of DGN staff members and several police officers. Earlier this year, a student substance-abuse case occurred on school property. 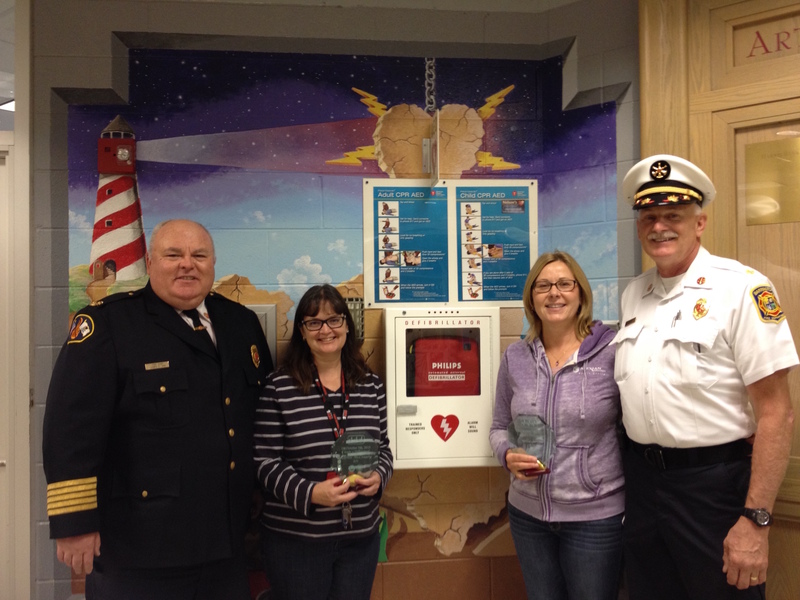 Nurse Tamm and Nurse Hansen-Hyman took immediate action to help save this student’s life. The statement on each of the awards reads, For her quick and decisive actions taken in an incident with an unconscious subject, in which she provided life saving measures that resulted in the saving of a person’s life. Congratulations to Susan Arndt and Michelle Shannon for successfully taking and passing the NBCSN exam!!! A HUGE shout out to School Nurse Kathy Knawa who was one of the featured speakers on a TV commercial for Cook County Public Health “Health Spots”. I just viewed it on CBS this morning…Wow! A major network morning show! Kudos to Kathy! Kudos to Katy Casey, school nurse in Downers Grove District 58, for representing IASN on the IDPH PANDAS/PANS Advisory Committee. Katy presented to the educators group during the first Summit meeting hosted by the Advisory Committee. Jessica Gerdes, ISBE School Nurse consultant, is also a member of the Advisory Committee. 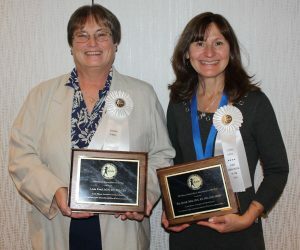 Congratulation to Linda Kimel of Rockford Public Schools (NW) for being selected as 2016 School Nurse of the Year and to Eva Detloff, Nursing administrator of Barrington Public Schools (NE) for being selected as 2016 School Nurse Administrator of the Year. They received their awards at the October IASN conference in Springfield. Congratulations to Jessica Minott for winning the poster contest at the 2016 IASN Annual Conference, Standing Strong for Students. Her poster was “Professional Development: Prevention, Treatment, and the Aftermath of Concussion”. This poster gives school nurses methods and tools for staff development aimed at recognizing and decreasing concussions in students. Congratulations to our 3 Emerging Nurse Leaders under 40 who are school nurses! Gloria Barrera (LS),RN, MSN, IL-PEL-CSN, Anne Marie Mullins (LS), BSN, RN, IL-PEL/CSN, and Saria Lofton, (LS), DNP, RN, IL-PEL-CSN, were recognized at the Illinois Nurses Foundation/ANA-Illinois ceremony in September and received their awards as three of the 40 Emerging Nurse Leaders under 40. Thank you for representing school nursing in such an awesome way! Congratulations to Linda Kimel, (NW), who was elected Co-Chair of the Special Needs School Nurses special interest group. Jessica Gerdes (DP) and Vyki Jackson (MS) were recognized with the NASN President’s award for their work in promoting Step Up and Be Counted, the first national school nurse dataset. Thanks for your hard work. Congratulations to Gloria Barrera, RN, MSN, IL-PEL-CSN, who is invited to represent Illinois public health nursing in Washington, DC and speak to lawmakers about the direct impact climate change has on public health through the Alliance of Nurses for Healthy Environments. What an honor! Congratulations Illinois school nurses Michelle Maurer & Kerry Warren!! Hope everyone has a chance to read their article in the current issue on NASN School Nurse on how to decrease exclusions!! Peg Braden, MSN(R), RN, PEL-NBCSN; Joanne Hathorn, RN, BSN, ILNCSN; Janet Ritter, RN, BSN, MHP, IL-CSN; and Susan Kuhn, MS, RN, IL/NCSN were selected for the Johnson & Johnson School Leadership Program at Rutgers in July. Their Community Partner is Cheryl Schutte from Erie Family Health Center. Congratulations! One of the University of Illinois Chicago APHN DNP students / Chicago Public School Nurse, Lorraine Legg-Coleman, RN, spoke on a panel at APHA and was featured in an article in the APHA Nations Health. Bravo Lorraine!! Cameron Traut, NASN Representative, authored the article on School Nursing in the current issue of Voice of Illinois Nursing. Martha Bergren, DNS, RN, NCSN, FNASN, FASHA, was presented the UIC College of Nursing Inaugural Judith Lloyd Storfjell Distinguished Award for Scholarly Practice. Dr. Bergren is a faculty member at the UIC College of Nursing. 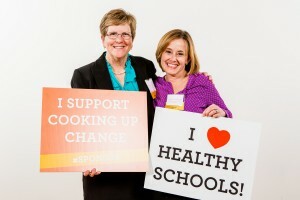 Mary Anne Wesoloski, IASN President, and Sandra Lawinger, Legislative Affairs Chairman, attended the Cooking Up Change extravaganza and support healthy schools with Healthy School Campaign, one of our partners in school health. 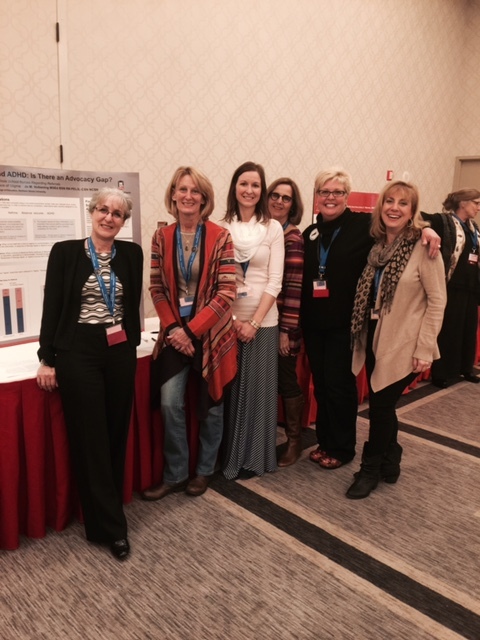 2015 IASN Poster Presentation Winner – Jo Volkenning, MSED, RN, PEL-CSN, NCSN, with her colleagues from Naperville District 203 nurses. Two additional school nurses received Those Who Excel awards from the Illinois State Board of Education. Michelle Curio, MSN, RN, PEL-CSN, of the Hazel Crest SD received a Recognition Award. Pam Seubold, MEd, RN, PEL-CSN, of Naperville School District 203, received an Excellence Award. Diana I. Salihar, BSN, RN, PEL-CSN, a k-5 school nurse in Ridgeland School District #122, is the only school nurse honored as one of the emerging nurse leaders.ANA-Illinois created this award to celebrate dedicated service to the population, encourage exemplar dedication to the nursing profession, and promise to grow in leadership for the advancement of nursing in ILLINOIS. Diana’s nomination shows how she effectively integrates health solutions into the education setting. One of her goals is to teach healthy lifestyle behaviors. Ms. Salihar embraces the challenge of balancing the needs of students with chronic illnesses requiring complex treatments, while integrating healthy solutions into an education setting. IASN congratulates Diana on this honor. Donna Rehm, MSN, RN, PEL-CSN/NCSN, (LS), Licensed School Nurse with Orland School District 135, has been nominated for ISBE’s Those Who Excel award and will receive an Award of Merit in October in Bloomington. Susan Geradot, MEd, RN, PEL-CSN (NE), of Plano Community Unit School District, was nominated for ISBE’s Those Who Excel award. Susan was recently elected to the IASN Nominating Committee. Congratulations to Susan. Martha Bergren, DNS, RN, NCSN, APHN-BC, FNASN, FASHA, FAAN, was chosen the National School Nurse Educator of the Year at the National Association of School Nurses annual conference today in Philadelphia, PA. Congratulations to Martha. Deb Clay, RN, BSN, PEL-CSN and Julie Loftus, RN, MSN, PEL-CSN are featured in an article on school nurses in the Western Springs Doings, June 18, 2015. They are the school nurses at Lyons Township High School in LaGrange and Western Springs. Many thanks to Traci Wicks, Marketing Consultant, for the wonderful logo for the 2015 IASN Annual Conference. Her mother, Barbara Wicks is a retired school nurse and active in IASN. Sue (Voss) Brady, RN, MSN, MPH, PEL-CSN has been appointed to the Cook County Department of Public Health’s Community Health Advisory Council (CHAC). Her role is that of a community member representing the north part of Cook County. It is wonderful to have a school nurse on this council. At a recent meeting, the committee reviewed the four MAPP assessments,which are key components contributing to Cook County’s WePLAN process. There also has been extensive conversation and discussion on the preparedness of Cook County and the Ebola concerns last fall/winter. Congratulations to Sue! Congratulations to Mary Colver, RN, PEL-CSN, of Little Fort Elementary in Waukegan School District is featured on a People Magazine video. See link below. http://www.people.com/article/mary-culver-school-nurse-dance-program Thanks to Peggi Braden, MSN, RN, PEL-NCSN, Health Services Supervisor in Waukegan for bringing this to our attention. Congratulations to Robin Adair Shannon, MS, RN, NCSN, IL-PEL, on her article “Students Requiring Personal Nursing Care in School – Nursing care models and a Checklist for School Nurses”, in the March 2015 issue of School Nurse News. She co-authored with Lindsey Minchella, MSN, RN, NCSN, FNASN, Chair of the NASN Special Needs School Nurses Special Interest Group. Nancy Antonini, BSN, RN., school nurses at Pioneer Grove school, was honored to be the Alumni Speaker at the St. Xavier College of Nursing pinning ceremony. She has BSN students in her school and was able to share her passion for school nursing with the new nurses. Beverly Horne, Linda Clarke, RN, BSN, MEd, NCSN, and Denise Rachy (sorry no photo) were nominated for a School Nurse Leadership Award from Healthy Schools Campaign. They are Chicago Public School Credentialed School Nurses of LSCV Division of IASN. Sandra Lawinger, MS, RN, NCSN, has been named as the Educator of the Year for Glen Ellyn School District #89. She is the nursing coordinator for the district and is the Legislative Advocacy chairman for IASN. Congratulations! Susan Gregory, RN, MSN, PEL-CSN. Congrats to Susan! A Credentialed School Nurse with 20 years of nursing experience, 15 of them as a school nurse in Joliet Grade School District 86 and Valley View School District 365U, has been named VVSD’s Health Services Coordinator effective for the 2015-16 school year. Susan Gregory, who has served as school nurse at Humphrey Middle School in Bolingbrook for the past year, succeeds Cathy Rigali who is retiring. Gregory, a Registered Nurse, came to Valley View after handling school nurse duties in District 86 for 14 years where she was a member of the district’s Student Wellness Committee, Safety Committee and District Council. Prior to that, she was an RN for Our Lady of Angels Retirement Home and Provena St. Joseph Medical Center in Joliet as well as at Mother Theresa Nursing Home in Lemont. The Shorewood resident currently serves as a facilitator for the Illinois State Board of Education on-line course “RNs in Schools—Expanding Your Special Education Role” and is an adjunct faculty member at University of St. Francis. She is a former member of the Healthy Schools Campaign’s School Nurse Advisory Committee and a former health and nutrition instructor for the Joliet Partners for Healthy Families. Robin Shannon, MS, RN, MCSN, PEL-CSN, LakeShore Calumet Valley division, presented a quick summary and how-to of writing IEPs. In 20 minutes, she hit the essential points. Mary McCarter, RN, ADN, BS, PEL-CSN, LakeShore Calumet Valley division, provided a great lesson on the use of massage therapy in the school health office. 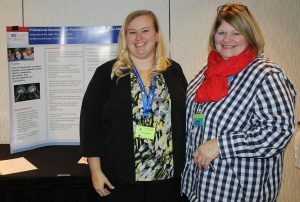 Cameron Traut, RN, NCSN, MS, Northlakes division, and Barbara Marzillo, BS, RN, MEd., PEL-CSN, LakeShore Calumet Valley division, presented on the development and successes of their concussion protocols and programs. Needless to say – all of the presentations were extremely well done and met the needs of the school nurses and RN’s present. Linda Gibbons, MSN, RN, PEL-CSN, NCSN, LakeShore Calumet Valley division, was nominated by Sue Hickerson, retired nursing director of Community Health Nurse Agency in La Grange, as an American Red Cross Nurse Hero. Mary Girardi, BSN, RN, PEL-CSN, Northeast division, Education and Certification chairman, has gone above and beyond in preparing and shepherding the IASN application to become an approved provider of nursing continuing education. This task has proven to be monumental and Mary has stayed on top of it. Kristin Joseph RN BSN PEL-CSN, Dupage Valley Division, received a grant from IPEF of IPSD 204. Georgetown Elementary School of Indian Prairie School District 204 will now have an urban hydroponic garden. This will enhance student learning and impact students health by teaching them about growing healthy foods.